One of the challenges posed to rural biochar stove projects can be monitoring and evaluation of not only the stoves themselves, but continued use of the stoves and the effectiveness of the biochar produced as a soil amendment. A group of stove experts and researchers working with CARE Viet Nam have been working with villagers to examine how to improve soil health while reducing the amount of indoor and outdoor pollution from smoke utilizing improved cookstoves that produce biochar. IBI reported in early 2012 on earlier stages of this project based in two mountainous provinces in northern Viet Nam, Thai Nguyen and Thanh Hoa. The staple food crop in the area is rice and the farmers use the straw for animal feed and for fuel. Most of the stubble is burnt in spring although some farmers burn during the winter. The burning emits a large amount of smoke; a small amount of biochar and ash are also produced, which remains in the field. In addition to the stoves, four drum ovens were built and operated by women’s groups to produce biochar. This biochar was made from a mixture of bamboo and wood soaked in nutrient rich ponds for approximately six months, along with rice husks and straw coated in lime and clay. Some of this biochar was used to make compost and the remainder was stored for later utilization in the field trials. The women’s groups were taught by the Soil Fertilizer Research Institute (SFRI) how to make compost from buffalo manure utilizing the biochar, and how to add micro-organisms and an indigenous leaf that accelerates the composting. 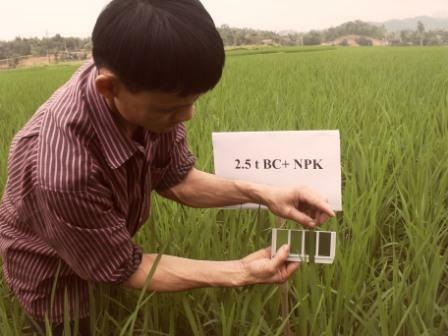 SFRI then carried out field trials utilizing biochar and biochar compost mixtures in rice paddies over the spring and summer of 2012. All treatments had three replicates and a randomized block design was used to ensure that differences between treatments could be analyzed to determine if they were statistically significant. Overall, the evaluation found that the village women could produce enough biochar in the stove to add biochar at 5% to the animal manure to achieve improvements in yields in both the fields and in home gardens. 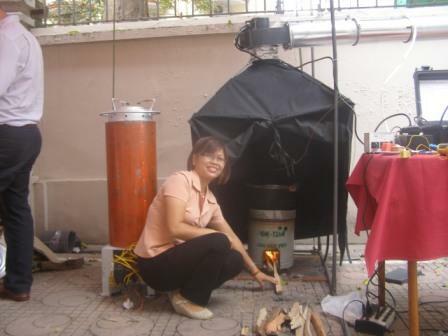 Based on testing and user evaluations overall, the project met its goal to develop and disseminate a biochar stove that is acceptable to the majority of users. Development of a more robust inner liner in the stoves (to further increase stove life expectancy) and mass production to reduce the cost could lead to wider adoption of this technology. The project team found that it will also be necessary to undertake a well resourced and planned extension program to train users in the operation of the stove and the new methods of composting. They also noted that longer term field trials along with more in-depth socio-economic evaluation to more accurately determine costs and benefits should also be conducted. This work was undertaken by CARE Denmark/Vietnam, the Population, Environment and Development Centre (PED), the Soil Fertilizer Research Institute (SFRI), Thai Nguyen University, the women’s union and farmers union in Thai Nguyen and Thanh Hoa Province, Cornell University, and the University of New South Wales (NSW), Australia. Funding was provided by the Energy and Environment Partnership (EEP) for Mekong, Government of Finland, and CARE Denmark. For more information on this project, please contact Morten Fauerby Thomsen or Stephen Joseph. 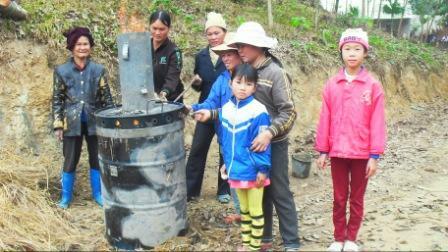 Village women setting up the biochar oven (all photos courtesy of the project). Performing stove testing for emissions. Setting up field trials at SFRI.